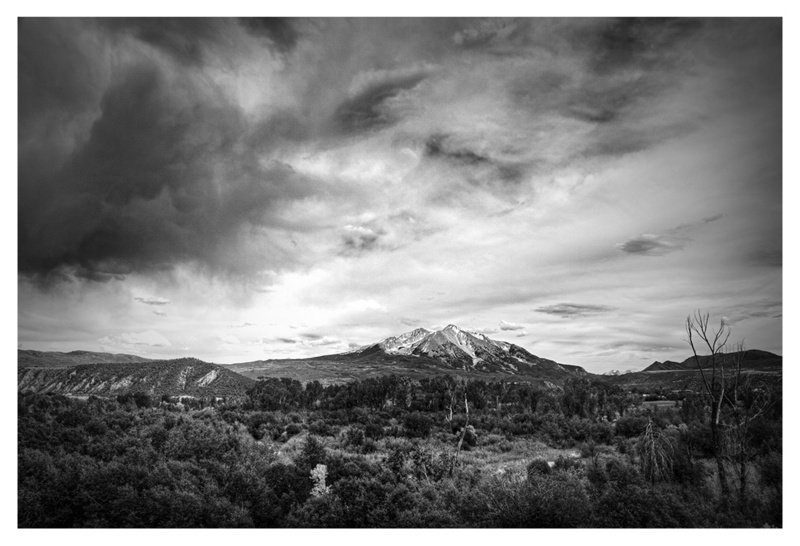 Last week I posted a color panorama and a black and white single-frame photograph of Mount Sopris and passing storm clouds. I also shot a panorama of the mountain and virga (streaks of rain that had fallen from the clouds but evaporated before touching the ground). After hiking up Mount Sopris a few years ago, I stopped on my drive back to Carbondale to photograph Mt Sopris and the fields on the edge of town. At the time I unfortunately only had a small Nikon camera (not a full-frame SLR), so I took a “double-tall” panorama to try to make up for the lack of a nice camera (and I thought the final panorama turned out well). This summer, I decided to head back to the area, wait for a day with dramatic storm clouds, and photograph the scene again with my full-frame SLR. When I stopped by (June), it wasn’t harvest season yet, so there are no hay bales in the foreground. Conditions aren’t always perfect, so I made do with the scene in front of me.